These "living fossils" might look like something extraterrestrial, but instead they are an ancient and thriving species. Though they may resemble crabs, Horseshoe Crabs are actually more closely related to ticks, spiders, scorpions, and mites. Photo credit: U.S. Fish and Wildlife Service, Delaware Bay Coastal Project. 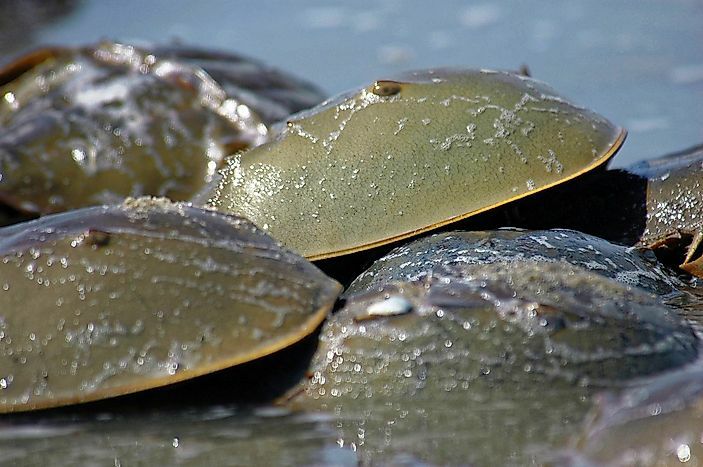 Many of us have seen the stereotypical red and yellow Crabs on strolls along the beach, but the ever-so-popular Horseshoe Crab, also known as Limulus polyphemus, is a sight much rarer to see. In fact, during 2008, horseshoe crabs caused quite the stir when Russian militants claimed to have found a “prehistoric fish” near Chelyabinsk. The story went international and many compared the look of the “fish” to a creature from the movie “Alien”. As the story gained global attention, many began to question the fish, and oceanographers soon assured everyone that the "fish" was in actuality the Horseshoe crab, which has been alive for up to 450 million years, and as such are oxymoronically referred to by some scientists as living fossils. The horseshoe crab has evolved little in it’s 450-million-year stint on Earth. However, the crabs are very durable and resistant to change, hence enabling their long span of existence, This durability is due to their hard, curved shells, which have long prevented many predators from accessing their soft underbellies. The horseshoe crab doesn’t look very much like a crab at all. In fact, it could be said to more closely mock the appearance of a Ray. Most horseshoe crabs are grey to brown in color, and can range from 14-19 inches from head to tail. Females are the larger of the two sexes, with most females being around one-third larger then their male counterparts. Horseshoe Crabs eat various species of worms and clams found on beaches and along the ocean floor. The crabs' unique pincers near their mouths and on their legs allow them to grab and take hold of their prey to raise them to their mouths. Mollusks and Crustaceans are some of the Horseshoe Crabs favourite foods, and they tend to feed at night when the threat of natural predators of their own are lowest. Like most oceanic creatures, Horseshoe Crabs have different developmental stages which require different habitats within their respective timeframes. During Spring and Summer, eggs are usually laid on coastal beaches. Thereafter, Horseshoe crabs can be found in tidal flats and on the sandy ocean floor. Adult Crabs will often venture deeper into the ocean in order to feed. These Crabs can be seen along the East and Gulf coasts of the United States of America and Mexico. A different species of Horseshoe Crab can be found on the Pacific Coasts of Asia as well. These Crabs are scavengers of the ocean floor, which is also where they spend most of their times and find their food. In order to swim, the Horseshoe Crab will flap it’s tail's spiny extension from its abdomen, which creates a whirlwind, whipping motion that allows the creature's movement. Between the ages of nine and twelve years old, Horseshoe crabs will begin to mature sexually. Horseshoe Crabs will concentrate in large groups in shallow coastal waters to begin mating. During mating, the male will climb onto the females back holding the sides of her dorsal plate. Then, the female, who is larger then the male, will carry him around on her back for up to several days following their pairing. When ready to lay her eggs, a female will dig a hole about 6 inches deep into the coastal beach sands. A female will lay approximately 1,000 eggs, of which the male will try to fertilize. Horseshoe Crab eggs take about six weeks to hatch, after which they will make their way into the ocean, where many will die. Nonetheless, the high rates of egg production have left the Horseshoe crab population stable and healthy for millions of years.